Martial arts legend Bruce Lee handles the deadly nunchaku in a different pose on both sides of this Bruce Lee lunch box. The Bruce Lee Nunchaku Tin Lunch Box is black and has a sturdy plastic handle with a metal latch closure. The front and back each have Lee wielding the nunchaku weapon with the words "Bruce Lee" in large white letters on a red and yellow dragon pattern background. The sides also have his name in white letters. 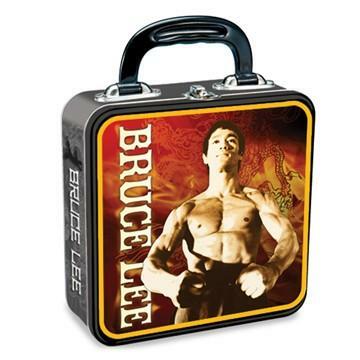 Bring "the dragon" with you on your lunch break with this Bruce Lee lunch box!